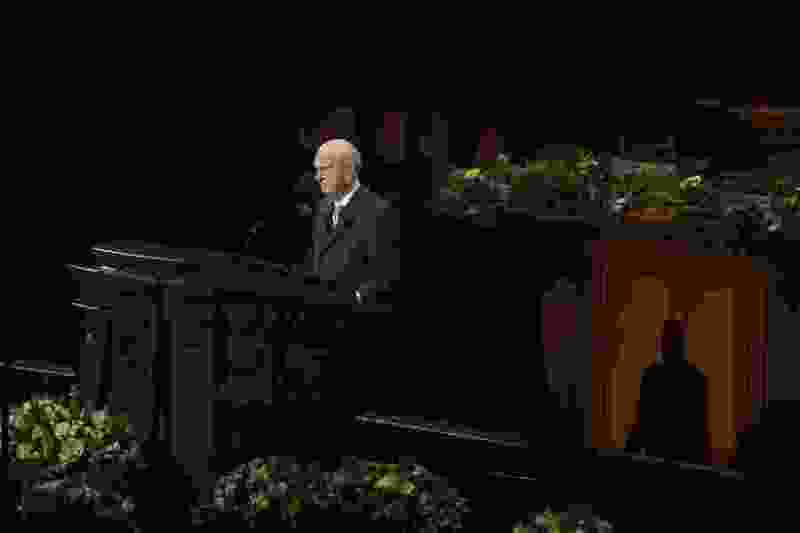 (Jeremy Harmon | The Salt Lake Tribune) President Russell M. Nelson announces seven new temples, including ones in Russia, India and Layton, during the Sunday afternoon session of General Conference on April 1, 2018. Of the seven new temples announced Sunday by new LDS Church President Russell M. Nelson, one is planned for Russia, a country where Mormon proselytizers can’t even call themselves “missionaries,” another will go up in India, the world’s largest Hindu nation, and yet another will be in, well, Utah, already home to nearly 20 of the sacred edifices. Yes, Layton, with LDS temples just to its south in Bountiful and its north in Ogden, will boast the state’s 19th Mormon temple. But that hardly tamped the enthusiasm of Layton residents and other Utahns. The news drew audible gasps from the audience in the Conference Center in downtown Salt Lake City. Stevenson said the structure will boost Layton’s desirability as a place to live and benefit the entire city. The four other new temples are planned for Managua, Nicaragua (that country’s first as well); Salta, Argentina; Cagayan de Oro, Philippines; and Richmond, Va.
News of the Russian temple — to be built in “a major city yet to be determined,” Nelson said, — also caused a stir in the Conference Center. The church has 159 operating temples, with 30 more either announced or under construction. Independent Mormon demographer Matt Martinich, who tracks LDS growth for cumorah.com, said all of the locations have been listed on his blog as likely candidates. In 2016, Russian President Vladimir Putin signed a stringent anti-terrorism law that severely limited outreach by any religion, except for the Russian Orthodox Church. The Utah-based LDS Church reduced its missions there from seven to six and its missionaries are now called “volunteers.” They can’t knock on doors to discuss their religion or distribute pamphlets on the street. Tensions also are high between the United States and Russia, home to more than 23,000 Mormons, over the poisoning of a Russian double agent in Britain, prompting Washington and Moscow to take turns expelling diplomats. Martinich believes the temple could end up in Moscow or Saratov. The selection of India, with more than 13,500 Latter-day Saints in 43 congregations, did not surprise Martinich. In fact, Nelson is slated to visit India as part of an 11-day global tour set to begin next week. The temple is planned for Bengaluru. Nicaragua, the third country getting its first LDS temple, has nearly 100,000 members who travel to Costa Rica, El Salvador and Honduras to participate in temple service in Central America, where Mormonism has been expanding for decades. In the other announced temple locations, the LDS Church reports 450,000 members in Argentina, which is getting its third temple; 750,000 in the Philippines, which will have five temples announced or dedicated; and nearly 100,000 in Virginia, where the temple will be the state’s first.